We’re conducting a social media experiment. We’re seeking to add 100 users to our Fan Pages in the next several days. If you are a Facebook user, simply go to the following pages and select Become a Fan. Once we’re at 100 users we’ll announce the Facebook URL assigned to us. We’ll repport back and let everyone know how long it took to reach this goal, and the effects of viral marketing online via Social Networking. Thanks for particpating Facebook users. Listen in, and if there is something you’d like discussed, leave us a comment. 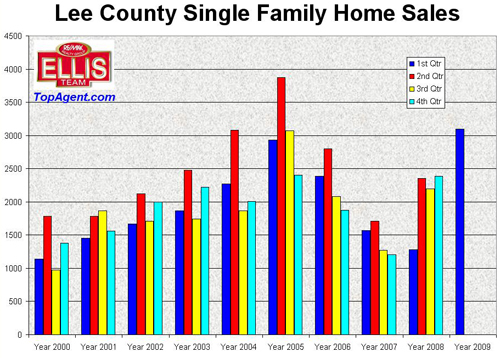 Lee County single family home sales sold at a record pace for the 1st quarter of 2009, eclipsing the 1st Qtr of 2005. This follows the 4th Qtr of 2008 which was the second highest quarter on record, taking a backseat to you guessed it, 2005. The bubble burst of years past has actually helped make homes affordable again, and combining that with a $8,000 first time home buyer tax credit in effect until Dec 1, 2009 and low interest rates, and median prices as low as 1997 prices, you’ve got a perfect storm again for dramatically increased home sales. We believe 2nd Qtr home sales in Lee County will again be very strong, however home sales could slow later in 2009, but not for the reasons you might imagine. Yes, interest rates have been climbing almost as fast as the price of oil, and both can negatively impact home sales. The real reason home sales may decline in the 2nd half of 2009 may be that inventory is drying up. In the coming weeks we’ll present some inventory graphs that will illustrate exactly what is happening with inventory. You would think that as inventory declines, prices would go up, and that is typical in a real estate cycle. I think this cycle could be different. For years, buyers have been conditioned that prices are going down and to wait for the bargains. Buyers are just now getting the word that the bargains are disappearing and many are fighting with other home buyers to get the few bargains available. Some buyers however, haven’t gotten the memo, and are still making offers at or below asking price, and they wonder why they’re missing out on house after house. They’re not properly educated on what is actually happening in real time. Jobs are not growing yet in SW Florida. Right now we have investors coming in and scooping up the bargains and competing with home buyers because sales prices are so far below replacement cost builders can’t afford to build. These prices are an anomaly and will not stay at these low prices forever. This all leads me back to why I believe home sales could stagnate in the 2nd half if lenders don’t keep the foreclosure pipeline streaming. There are two schools of thought on where prices are headed. First is the old Supply Vs. Demand theory, that as inventory levels drop and buyers feverishly buy, prices automatically will go up. In fact, we are seeing evidence of this occurring in certain segments, particularly waterfront and entry level Cape Coral homes. Prices have bounced off the bottom and have been on their way up since last year. The other school, and this theory is just my own and not economically tested, is that prices are so far below replacement cost, buyers have become conditioned to buy so long as it’s a bargain. What happens when the bargains are gone and prices begin rising? Will buyers buy in fear of prices tomorrow being higher than prices today? Something tells me sellers will be staring down the buyers with a “gotcha” type mentality because sellers have taken it on the chin for so long. Buyers may look at the sellers and say “You don’t have me, I’ll just sit back and do nothing now that it’s no longer a Deal.” And hence the stare down begins, and the question becomes, who blinks and how long does it take? We saw some evidence of this after Hurricane Andrew on the East coast. Transactions slowed as buyers faced with diminished inventory couldn’t accept right away the new pricing the market brought to bear, and the stare down game began. We do have some foreclosures backlogged in the system, and we’re going to need them to be released. They all have to sell anyway, and the longer they sit vacant the more the properties deteriorate from lack of maintenance, storms, water damage, vandalism, etc. Nothing good can happen with a vacant foreclosed home in a neighborhood, so the process of foreclosure and getting a new end user in actually helps the healing process of the market, and until we complete this process our market will not be healed. Ultimately the wild cards are how many foreclosures will come to the market, and when will employment in SW Florida rise. Pricing will most likely follow both events, and to some extent interest rates. Interest rate increases cut into the buying power of buyers, and many first time home buyers are tight. The other factor will probably be public perception of the overall economy and how people feel about their job and their overall financial situation. The market’s ability to assess and discern what is truly happening in the real estate market, without all the fluff, will go a long way to determining when prices will start rising again and how quickly. So the SW Florida real estate market is currently setting sales records. In the coming weeks we’ll do our best to break down by segment exactly what is happening in our market and what it could mean going forward. The Ellis Team is looking for a person or persons with strong people skills and proficient in Internet lead management, e-mail, and database management. This person will be a good listener and preferrably will be a licensed agent or willing to obtain license. This candidate will have knowledge of the SW Florida Real Estate market, and is good on the phones.